The result is this short sequence of a character attempting to jump between two roof tops but failing to make the distance. The character features on of Gary Pye's recently released Comic Faces which you can read more about under the next heading. 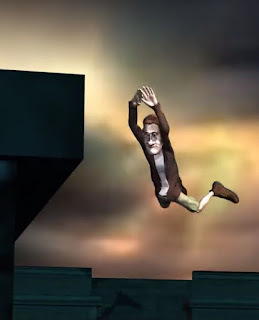 Watch the finished scene in the animation below, that is also a comparison between my first render of just creating the basic action, and my second render, done a few days later, that includes some facial expression and a little more arm movement once the character realises he's falling. I wouldn't say it's perfect animation by any means. I had issues key framing the arms and legs. If you look a little too closely you'd swear the character has broken his shoulders. However, for a few hours of messing around, with no real plan, I think it works okay. Something else I did on this animation for the first time was set up a path in iClone for a camera to follow. Path's are not limited to cameras. You can attach lights and other objects to them as well. Maybe even characters... I haven't really explored them much as yet. In the second animation the camera has an 'ease out' setting added so it doesn't stop quite as abruptly as it does in the first animation. 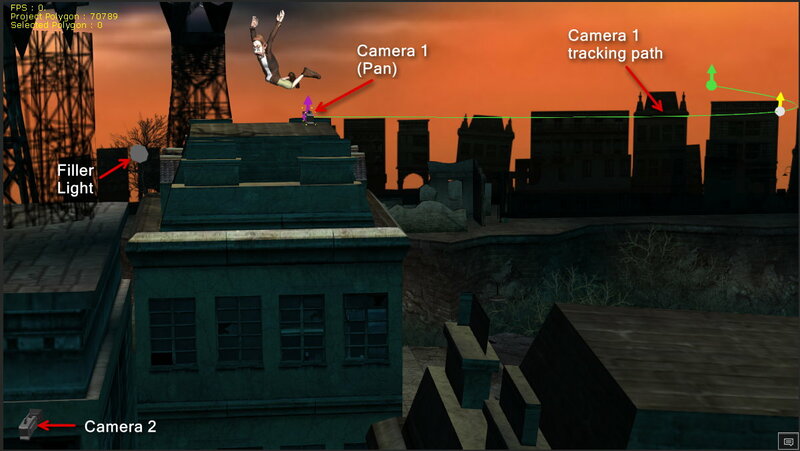 Below is a screen shot of the iClone stage where you can see the green path my camera follows in the opening seconds before switching to camera two, which records the actual jump. Camera, path and light set up in iClone 6. Other things to notice in the above screen shot is my filler light, which I placed so that my character's face wouldn't be in shadow. Both the cameras and the filler light are set to track my characters movement automatically with the 'look at' setting. This setting makes it a complete breeze to set up tracking shots with a camera as, no matter where you place the camera, it always looks at its target. Finally, it's worth mentioning that the set I used is called the 'combat stage' that comes free with iClone6. It's a great set for practice animations, in a city environment, as it's a complete set that you just add a sky to, then you're good to focus on creating your animation. Since winning Reallusion's Animation@Work competition Gary Pye has carved out a strong niche as a Reallusion Content creator. 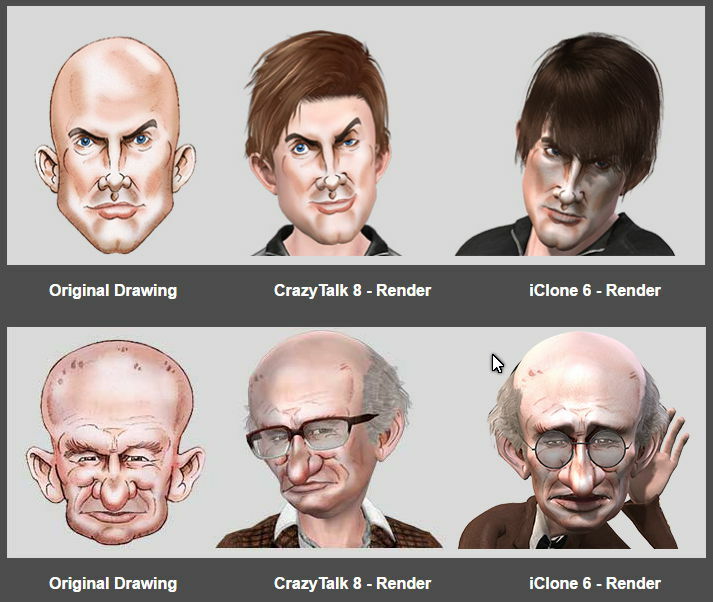 Gary has an extensive catalogue of 2D props and characters for CrazyTalk Animator 2 available to buy, and has now branched out into 3D characters with his new Comic Faces pack for CrazyTalk 8, Character Creator and iClone 6. Gary's Comic Faces give a more cartoon, stylized, hand drawn appearance to 3D characters. The image below demonstrates how the faces might look in both CT8 and iClone. Just like any other character you can change their look simply by choosing different hair and other accessories. how they render in CT8 and iClone6. I'd strongly urge you to check out the product page for Gary Pye's Comic Faces where you'll find some truly outstanding illustrations created by Gary using his comic faces. If you have CrazyTalk 8 and iClone 6 they're definitely worth having in your content library.